Four instances that give different insights into the mind of a great human being who was also a favourite of political journalists. Whether you liked his politics or not, Atal Bihari Vajpayee will be among the favourite politicians of almost any political journalist of his times. One, because he was big hearted, and second, he always had a smile even in a tough situation. The first time I met him, I wasn’t 26 yet. I was covering Assam in Guwahati and I got a call from the local Bharatiya Janata Party (BJP) office asking me to come and meet Vajpayee. I went to the guest house where he was staying, on the outskirts of the city on a hill, and I thought I would be ushered into the VIP room. But he was sitting outside on the steps of the guest house and said, “aap toh naujawan hain (You are a young man, come sit with me here).” And we chatted for an hour, where he listened to me and let me talk. He didn’t lecture me, unlike all politicians who only want to lecture you. He said, “Look, I understand that this is a very complex problem in Assam; it involves Hindus, Muslims, India, Pakistan, history of Partition, Bangladesh, Assamese, Bengalis…” And then he said, “I don’t know who will ever resolve this.” And we see even now with NRC the problem is still with us. And the previous day, he had fractured his foot in Mehsana in Gujarat and had a plaster. So one of us asked him, “How will you fight the Congress party now with your foot in plaster?” and he lifted his leg and displayed it for the cameras, and said, “Their hand (Congress symbol) and my foot.” Everybody laughed, and he laughed. That was his method. This was January 1985, 33 years back. He said, “We have some young leaders like Pramod Mahajan in Bombay, and Arun Jaitley in Delhi…We have to find a few more like them.” So that tells you something about his prescience, and also his big heart. But I was summoned to see him over breakfast. So he said, “Let’s wait for some time, I don’t want this to have the Bofors curse. Let’s wait and find out more.” And he and Jaswant Singh exchanged notes and then they decided to not talk about this. And that scandal, or so-called scandal, died at that point. When they came to power for 13 days, they saw the files and they figured what the truth was. The truth was that just as India was having its elections, Yeltsin was having his election. And the factory that makes the Sukhoi in Russia was based in Yeltsin’s constituency and had not paid salaries to its staff for a long time. So Yeltsin requested Rao that if he could pay an advance to his government, they would be able to pay salaries which would work for his election. Rao made that deal not to shore up his electoral prospects but Yeltsin’s. India needed that plane anyway and got a good deal. 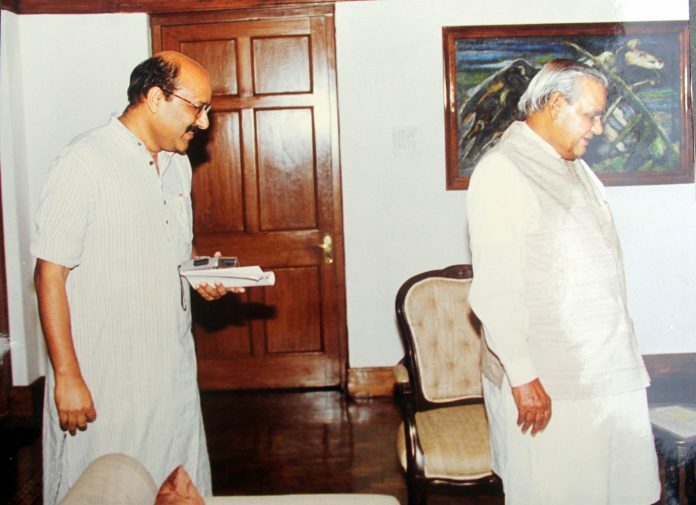 Later, when Vajpayee lost and H.D. Deve Gowda’s government came to power, he, Jaswant Singh, Mulayam Singh Yadav, and Congress leaders, in a story that I have described in detail in ThePrint, got together. They studied the entire deal and figured there was no scandal in it and let the deal go through. And today the Su-30 is the pride of the Indian Air Force. So he said “Haaaaan, obviously, Atal ji should not be sleeping. PM should get a rifle, climb the mountains in Kargil and fight the Pakistanis because this country is so short of young people!” It was very disarming and also very funny in an extremely tense environment. It also tells you how to deal with stress. “Shekharji, yeh samay hai chhutti par jaane ka? (Is this a time to go on vacation? )” he asked. I thought he’s really going to war. And then he gave me a little lecture. And then he said, “Dekhiye, when you begin a war, where you begin a war, how you begin a war, is entirely in your hands. Where the war will stop, how it will stop, when it will stop, is not in your hands.” That’s why a leader, a rajneta (statesman) as he said, has to stop many times before taking his country to war. “Well, the preparation and the threat of war have to be so real that even we believe it, and you believe it. Only then will coercive diplomacy work, and if it leads up to war, it leads up to war, I will take that risk,” he said. These few instances give you different insights into the mind of a really great human being, a statesman, however imperfect. How does Shekhar Gupta calling Vajpayee जी imperfect, matter. Because we have this tendency to make our best leaders into Gods and then their imperfections and human traits disappear. Why did u leave the article with “however imperfect”. I agree, no human being is perfect, but to end this nice piece with that, not so nice Shekharji. Also, the examples that you listed of your encounters with him, were actually very nice and shows how calm and composed he was in decision making also. Why end it with “imperfect”! The adjective ‘perfect’ will be applied when Sonia Gandhi’s obituary is written; that’s how mainstream English language journalists perceive perfection.